Location: Overlooking the Black Sea, the resort is 17 kilometers from Varna and is 20 kilometers far from Varna Airport. Accommodation: The hotel counts 728 keys for seaview and park-view rooms and 31 suites, all equipped with air-conditioning, satellite TV, safe deposit box, work desk, bathtub, balcony, direct dial telephone, radio, minibar, bath/WC, hairdryer. Facilities: Main restaurant with brewery; saffron Thai restaurant; Cafй Roma; Veggie bar; Music square; Enoteca, piano bar ; Casino; Cigar & news boutique. Outdoor swimming pool with children's section, poolside bar and cafe; heated indoor swimming pool. Nirvana Spa centre with a wide range of health and beauty treatments; fitness centre and solarium; sauna with outdoor garden; Turkish steam-bath; PC & Internet stations; wireless internet access in some public areas and LAN connection in rooms; business desks and secretarial services. Meeting and conference facilities; exchange desk; limousine and jets hire, logistics and information services. Room service; laundry and dry cleaning service; safety deposit boxes. It was a an excellent experience! Loved the hotel, very friendly staff and tasty food. Advising all to stay there! Their pool is very clean and lifeguard is really handsome :-P I spent a week there and there is no other hotel to compete with Melia (Admiral is located in such a noisy place and too small). Dirty glasses, bad servicies, bad personals. would you please let me know how far is the hotel from the beach? The description/location doesn't seem to mention anything about distance to the beach/sand. Thank you! Could you prepare a booking for 2 adults , 1 child( 5 years old), sea view, from the 20 july to the 30 july 2008. pick up to the airport from varna. i want to finalize ASAP. Please send me the price of a double room with sea view(2 adults and 1 child 3 years old)for 7 days between 1-15 July, with all inclusive. Make me a promotional offer. We have the group for 50 person. They are going to hold the comference in Bulgaria. They have chousen your hotel for this purpose. 10 SGL and 20 DBL. 2. The separate restaurant, there they could make the final party. Looking forward to hearing from you and hoping for our kind cooperation. Kempinski Hotel Grand Hermitage is just so amazing. My wedding reception party was held in there. The settings were amazing, the survice, and the food Oh,my God!!! !If tyo are looking for a place to celebrate special occassions, this is the place you should go to. We were staying in hotel up the road from Kempinski,On our first night we wlked down to the seafront and as we turned a corner we saw the Hotel,The only description I can use to do the place justice was "Stunning". Being nosy Welsh I had to see Inside and again It was all top notch,The staff were very friendly and I ended up buying Jewellry which was better priced than Jewellers in Varna.We had a look at the Admiral another night and if that is 5 star the Kempinski should be 6*. Just got back from Kempinski Varna. Everything is completed and the hotel is just grand! and top of it it is quiet, etc...Just loved it! 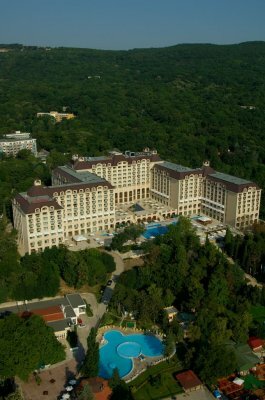 All i can say that my stay here in Kempinski was the best ever and it is a wonder to have a hotel in Bulgaria like this. Been to Varna 3 times before, and this hotel has got me to plan another trip soon. can please someone give me a very recent update on the Kempinski? facilities all available? finished? service? entertainement? going there as a single...is it worth? Have just read some comments baout the hotel, i am somewhat concerned that the hotel is not finished and therefore not worth the money. I am astudent and have saved hard to go on hoilday here, please can someone reassure me! Stayed in the Kempinsky now the second time and can only say, for business its great! LAN, Wireless in some areas, business centre, etc.. I have to admit though, the most expensive hotel I stayed so far in Varna, still, for me so far its worth it. 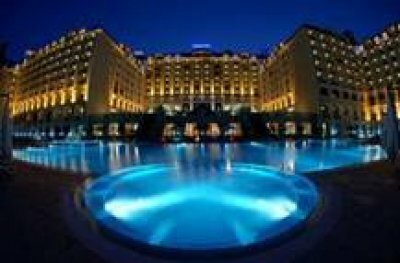 i have just came back from the splendid hotel in golden sands kempinski!it is just gorgeous.i went their spa and it was something i wont forget,very good therapists.the room was great and food as well.i will go back there to experience it one more time! I have just returned from there, everything seemed to be ok.I liked this hotel very much, my stay there will be memorable for me. The Spa center is great, i tried some of the treatments, which were ready, there were some others like Aurveda and wine therapy( i was really curious about it), which weren`t yet finished. I liked the food, the staff was friendly, the cleanliness all over the hotel impressed me a lot.The only thing I didn`t like is the entertainment, so far it is a little bit poor. I was told that the night bar will be open on May. I will really recommend this hotel to my friends, willing to stay in a 5* hotel. check this hotels facilities very carefully before you book, I booked to go here the end of may2006, a long time after booking i received a letter saying that most if not all of the hotels facilities would be shut, but it was still the same price !!!!!!! going to the Admiral instead,the kempinski may look "grand" but it is just a shell.....beware. we about to make reservation in the Golden sands hotels and we would like to know what is the status of this hotel due to the fact that it's still under constructions. comments of people who were lately there are very welcomed.